Is it Thriller’s 25th anniversary? Its 50th? No, it’s the inauspicious 35th anniversary of the album and CBS’ press release doesn’t even explicitly mention Thriller as a music source. You know what it does mention? “Millennials” who meet at a “at a mysterious hotel located at 777 Jackson Street” and go on an “unexpected, magical adventure of personal discovery, culminating in a spectacular dance finale featuring an animated Michael Jackson.” Yes. An animated Michael Jackson. That all sounds great. Jackson has had some posthumous material released since his death in 2009, but this special is a far cry from simply re-releasing his old performances. 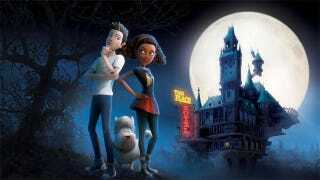 Creating an animated Michael Jackson to star in a Halloween special is essentially cashing in on the singer as a brand, which seems like a super-weird decision to make in 2017. Although given Captain EO and Moonwalker, chances are Jackson himself would wholeheartedly approve. The special will air sometime this fall.